With all the hype about urban bike sharing and the Vélib/Velov/Bycyklen/Bicing/Bixi/etc/etc let's send a warm thought to the forgotten city that started it all, shall we? La Rochelle, on the French Atlantic coast had a legendary mayor back in the 1970's. Michel Crepeau. He was quite the urban planning revolutionary and the rest of France thought he was quite mad. At that time progress was built in concrete and asphalt. Inspired by Copenhagen, he created pedestrian streets in the city centre and, in 1974, he started a bike share programme. Both Amsterdam and Copenhagen flirted with bike share programmes back in the 60's, but they didn't last. La Rochelle was the first city to make it stick. Until Copenhagen, in 1995, started their City Bike (Bycyklen) system and the idea started to spread. He bought a load of yellow bikes and slapped them into racks by the harbour. The original idea was merely "take one, use it, bring it back." These days you can borrow them free for two hours if you leave some ID. The programme never had a fancy marketing name like ByCyklen, Velib, VeloV, SEVici or Bicing, which is probably why nobody knows about it. But La Rochelle was the first, so hats off to them. 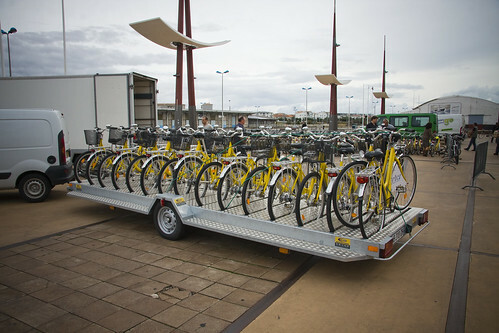 The classic yellow bikes have now been replaced with a modern bike share system, like in so many other cities in France. Indeed, there are over 30 cities in that country alone with modern bike share systems. And the fancy name came with it: Yello. But hey. If you're ever in the neighbourhood, be sure to pay a visit. In the summer season the whole centre of the city is closed off to cars and the street life is absolutely brilliant. 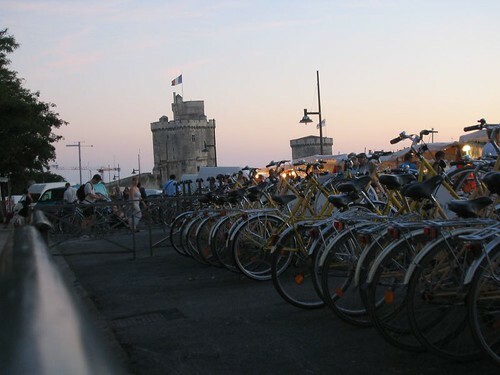 It's my favourite city in France and the nearby Ile de Ré is a bicycle paradise.